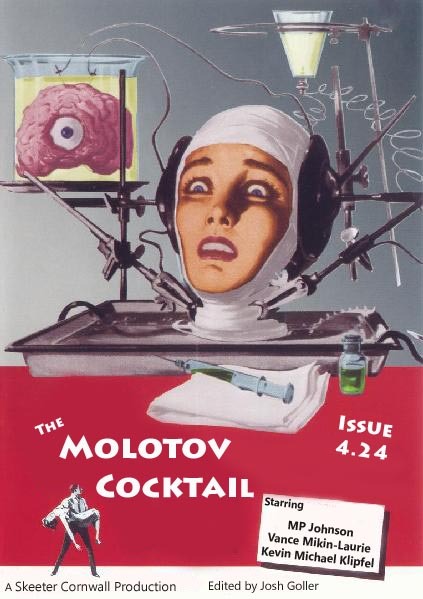 As we complete Volume 4, it’s clear that the Molotov Cocktail is the offbeat lit zine that won’t die. This landmark issue ponders what to do with decorative decapitations, gets distracted by colossal billboard bikinis, and chokes up on the bat. Featuring work by three first-time Molotov Cocktail contributors, Issue 4.24 sends Volume 4 out with a bang. As we roll over the odometer into Volume 5, we’ve got a lot to look forward to in the next year. Our long-awaited print anthologies (yes, yes, we’ve said it before) will actually become reality. The line-up for Best of Vols. 1 & 2 was finalized ages ago, and we’ll soon be contacting those writers from Vols. 3 & 4 whom we’d like to include in the second print edition. So enjoy the last of Volume 4 with these three incendiary pieces of dark and offbeat flash.